The Sinking Ship Effect is an effect by which distant bodies appear to sink into the surface of the earth. This effect was used as a direct proof in ancient times for the earth's spherical nature, and is a main reason for mankind's adoption of the globular hypothesis. In Earth Not a Globe its author discovers that this effect is inconsistent. Sometimes it occurs, and at other times it does not occur. A distant body such as a lighthouse will sometimes seem to be obscured, and that at other times the lighthouse will be revealed, allowing the observer to see further than the globe earth should allow. Rowbotham says that the sinking ship effect is most likely to occur when the weather is not calm and the observations are conducted over hectic ocean environments. In more landlocked areas such as lakes, canals, and ocean inlets, and under calm conditions, the effect often does not occur. This inconsistent nature of the effect is contrary to the argument that the sinking effect must the result of a spherical earth. With the advent of photography and time-lapse photography we can analyze this phenomenon closely to determine its true nature, observing that not only is the effect inconsistent, it is not a perfect effect either. The Skunk Bay Timelapses were taken by the Skunk Bay Weather organization with zoom photography, showing a dynamic refraction effect on a peninsula in the distance. The distant peninsula is at times hidden and revealed. Below are high resolution versions of all available timelapse of the Skunk Bay peninsula scenes. On this day there was a mixture of sunken and visible effects. On this day the sinking effect comes and goes. The peninsula was sunken throughout most of the day. On this day the peninsula sinking effect also comes and goes. The peninsula was visible throughout most of the day. At other times of the day, and for long periods, the opposite bay appears to be sunken. When the sunken scene is observed closely, and compared with the revealed version, we see that it is not a perfect effect. The sunken version contains vertical compression and squishing of bodies near the surface. Below is an animation of the transition effect between sunken and revealed scenes. The Inferior Mirage, denoted by its characteristic upside-down mirroring effect, decompresses from near the water surface and disappears, leaving behind the revealed scene of the peninsula. From the above content we learn that the sinking effect can happen for long periods of time over a single day. The sinking effect is seen to happen repeatedly over multiple days, in all available timelapses of that peninsula. There is some compression near the surface in the sunken version of the scene; it is not a perfect effect. At the transition boundary an inferior mirage is seen to compress and decompress. 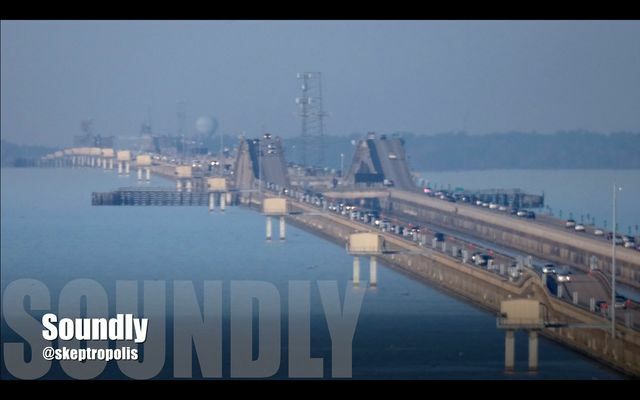 A YouTube author named Soundly is famed for the Lake Pontchartrain Power Line and Little Tensas Bayou photographs, which have been popularized to, supposedly, show evidence of the earth's curvature. Firstly, the reader should note that, if that curvature seen the photograph were actually the curvature of the earth, the image would suggest that earth is very small. Abstract: "A simple experiment is presented to visualize inferior and superior mirages in the laboratory. A quantitative analysis is done using ray tracing with both photographic and computational techniques. The mirage's image, as seen by the eye or the camera lens, can be used to analyze the deflection and inversion of light rays." An observation of the bay unzoomed. A surveyor named Wilhelm Martin performs an experiment (Archive) showing that light seems to bend upwards and downwards throughout the day. Taboo Conspiracy compares the distortion of a scene which should not be visible due to the curvature of the earth to an apparent sinking effect which appears later in the day. Sinking Ship Effect Caused by Ocean Swells - At times the sinking ship effect may alternatively be caused by obstructions between the observer and target body. This page was last modified on 13 April 2019, at 01:18.